I have die cut this image of a honey bee from a square of white textured card. I have curved the corners and given the card a yellow edging to tie in with the yellow watercolour card I have used as a background. 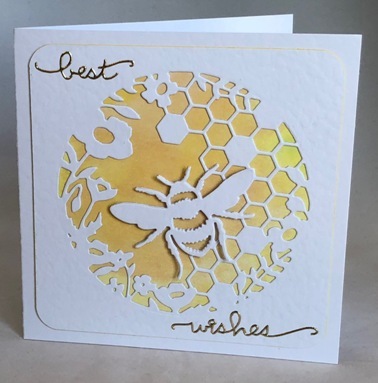 I then die cut the honey bee separately and added it to the card using thin 3D pads so that it hovers above the honeycomb and flowers. Finally I have added the words Best Wishes in gold lettering. The card is blank inside for your own greetings. If ordering by phone, please reference card #786.